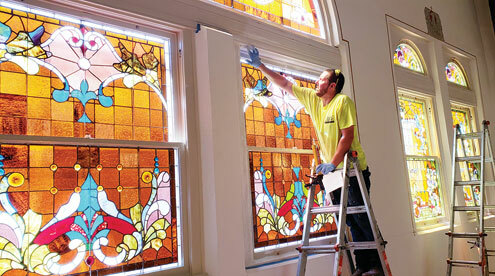 Jacksonville Stained Glass Company is putting the finishing touches on the installation of 56 restored individual stained glass panels in the windows of First Presbyterian Church in Louisiana. The windows were originally installed at the time the church was built in 1890. Ron Weaver, of the stained glass company, said their goal was to bring the glass in the windows as close to original as possible; but to add to their strength and durability with modern restoration methods now available. The windows have many jewels (small round glass pieces of jewel colors) and roundels (larger round glass pieces). Seventeen of the roundels had to be replaced, with each one hand cut after glass to match was found. He estimated the window’s new life expectancy at 150 years. The company guarantees their work on the windows against defects in workmanship for a period of 10 years. The two large center windows on the north side of the sanctuary were given as a memorial to William (1880) and Emma Pharr Stark (1881) and the two large ones on the south side are in memory of Mary G. Frier and John L. Fritz and John and Philipena Wyland. Through the blessing of gifts and pledges from many past and current church members and friends, funding for the windows was available. The memorial fund for Martha Shaffner Wahl, established by her parents, Mr. and Mrs. William H. Shaffner, Jr. and supported through the years since her death by her husband, now deceased, Robert Wahl, was a major source of funding, as well as the Clarence G. Wahl fund established by the late Mr. Wahl in memory of his parents, Charles and Emma Wahl. The Hunter Memorial Fund established by David and Wanda Hunter in memory of their parents, Russell and Russie Hunter and Hershel and Frances Bridwell, as well as other Hunter family members, provided some funds. The church established a Stained Glass Window Fund several years ago which was supported by gifts from church members and friends for memorials and honorariums, and along with member’s yearly pledges of support for the church, provided money for the exterior protective glass covering for each window with work done by Asquith Restorations of Louisiana. A special event to re-dedicate the windows to the Glory of God and to express appreciation to all who supported the project will be held at a later date when the public will be invited to join in the celebration.